It’s the first day of classes, and we are all ready. There are about 8000 attendees, and they descend on the South Convention Center for Breakfast. This year it’s muffins and coffee. ummm…yeah… We’ll push through this section with a few brief comments. First BRING BACK BREAKFAST! The muffins were delicious, as most muffins are, although I have no idea what they were since they were labeled “assorted muffins”. Since this is not a culinary convention, we should not be expected to know what type muffin is which. I suspect those with basic food allergies were perplexed. We were told the first day to “go upstairs, they still have food up there”. You can figure out how well that went over. I headed off to my first class, which was ID104-2L Showcase Your Design by Stephen Gabriel. This was a great class. Not too difficult. I like high level classes, but I am new to showcase, so the level was just right. I had waned to meet Thomas Fitzgerald, one of the lab assistants, but I had other responsibilities, and figured I’d meet up with him later. I’m sure there was a lot going on, but I just could not seem to get into the groove until later in the evening. 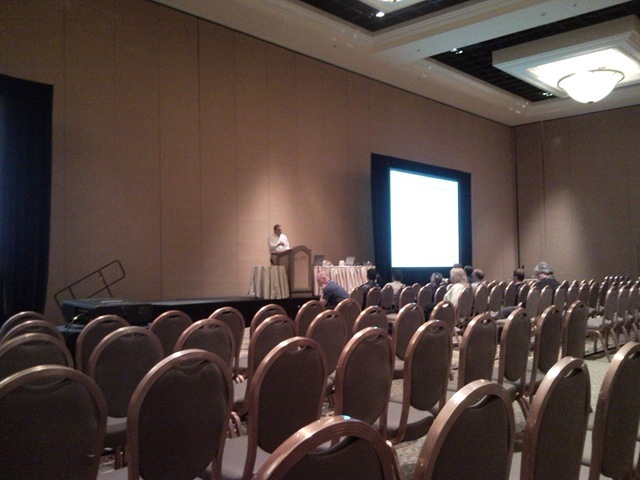 I had a little time to kill in the morning so I stopped off at the AUGI meeting. There was some discussion about local user groups, volunteer action, and leadership. An interesting study on interactive boundaries was brought up, and made me interested in seeing where the discussion was heading. However, I had to leave prior to the end, so I can’t say much more about it. I then got down to a usability meeting with Ananth Uggirala, Carlos Olguin, and Erin Bradner (who was somewhere behind the scenes), who I always miss meeting. We ran through scenarios, answered questions and played with things as directed. It’s all hush hush, but I can say that each time I meet these folks I always go in with the premise that there won’t be anything too interesting, and leave with a bit more hope for the future. They always surprise me. Ananth took a little extra time to discuss some interesting things about usability and development, and that helped me get over the fact that I missed the opportunity to meet with Elena Fadeeva’s study. I got there on time, but it seems that the early birds had already got things started downstairs at the Border Grill. We all tried to get around and meet new people, discuss some business and some not so business topics. The beer was cold and waitresses brought tapas about to munch on. The stuffed date things were awesome. Shaan Hurley took the mic and gave introductions and a welcome thank you to the crowd. He then explained that his head would not be shaved until THURSDAY! 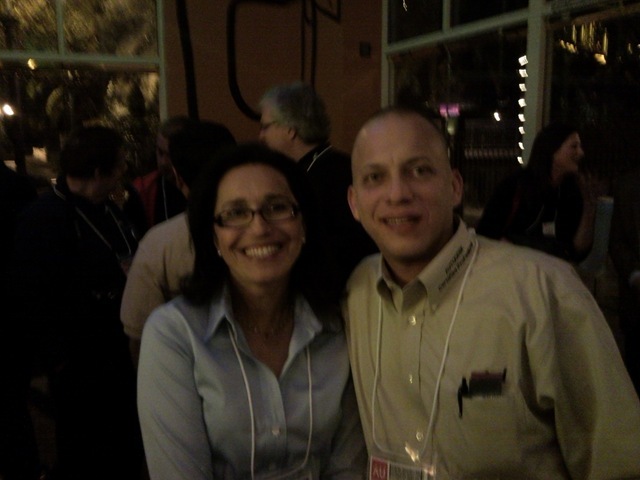 I got to thank Joseph Wurcher in person, and did not pass up photo ops with Lynn Allen and Karen Brewer, but we got kicked out before I could get the Civil Diva to take one with me. 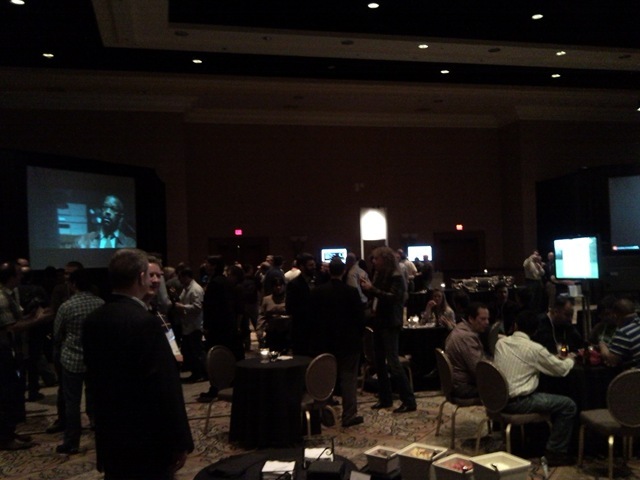 We moved over to the AEC Mixer, that had obviously been going on for awhile. The groups were quite dispersed, and seemed awkward, which I figure is because we got there so late. Our group continued discussions from before, and tried to find some food and beer to go with it. Ok, I tried to find food and beer while my friends made some pretty impressive BIM arguments. Then we got kicked out of there too. I said good night and headed in. The lower limit poker games were over, so I figured enough was enough. The day wasn’t as productive as I would have liked, but I got to meet some pretty cool folks, and got pictures with lovely ladies. Not a bad night after all. If you are going to AU, or just interested on keeping up with things, follow the Autodesk University twitter feed at AU_Online. This year they are planning various things for the AU twits, including some fun things. If you suddenly see 20% of the population run in the direction of the vender expo area, it’s probably AU twitter, and someone announced a ‘blue light special’. 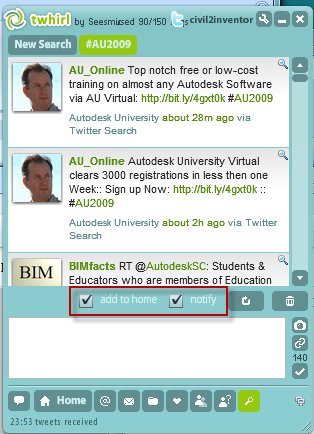 Log into your Autodesk University profile, and in the edits select the twitter setup button. 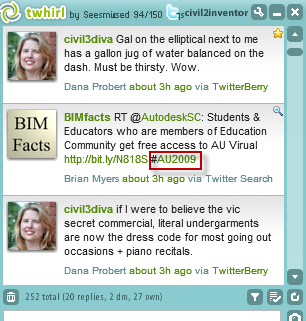 Be sure to include the tag #AU2009 it in your tweets. If you don’t have a profile (and don’t want to set it up), you can still watch all the AU tweets using a tag scan. I could see all AU_Online tweets, but not the rest of the community. Here I am using twhirl to illustrate. It took me awhile to figure it out. 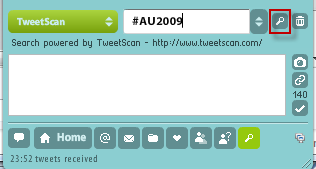 Just go to search, and swap over to tweetscan, then scan for #AU2009. The list will come up. Then check the Add to home and Notify boxes. Now on your home box, you’ll see them, even if you don’t follow the author. Pretty sweet. I still have not figured out what to do with Facebook, but twitter has become part of my daily life. I’m looking forward to how it will shake out this December. Are you going to AU this year? Stop by the LinkedIn AU group and tell us what you have planned, and what you are looking forward to. Come join he discussion and help me figure out who is going where and when ( and where I am supposed to be next). 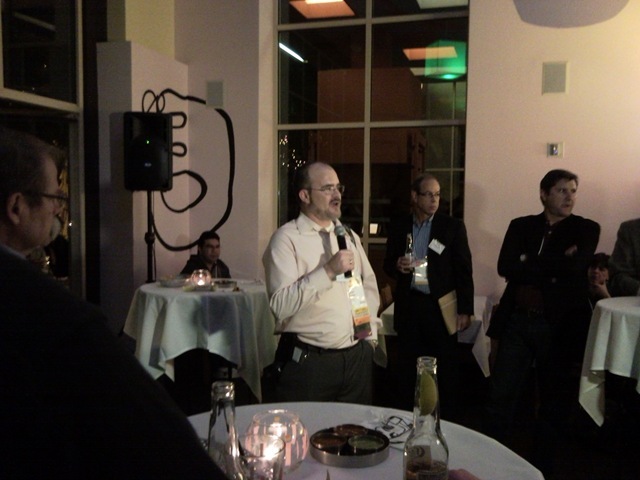 I have written a lot about Autodesk University recently. I can write volumes more about it, but I been reminded to cut it short. There is no doubt I love the experience, as I know all of you will too. I have fought a good fight to try and get there, and even this late in the game, I would jump at the chance and work out the disaster there if I got the chance to go. The thing that begins to plague me now is all the new professional relationships I had hoped to solidify this December. I will have to continue working on them, and hope for a great 2009. I would like to remind everyone about my Reasons on Instructors…Seriously read it again, and go to check out those instructors. Last year was incredible. Have a great Thanksgiving, and a wonderful AU 2009. Alright, now for the next installment. 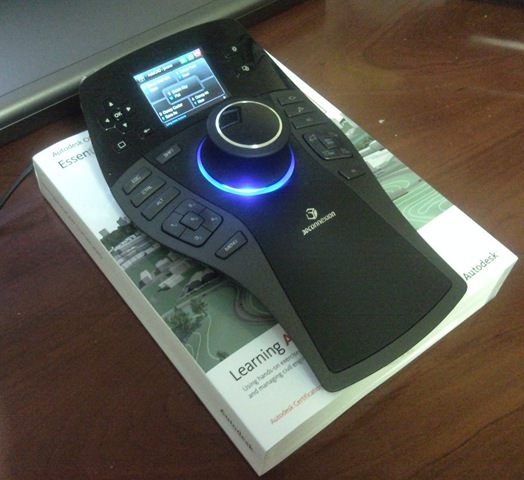 Did you ever go on TDY or assignment that was boring. The most exciting thing is when the hotel’s lounge puts out hot wings at happy hour? No one wants to go see anything, and they are all personality challenged. After class, the best food you can hope for is Denny’s. I’m not too sure that you will feel the same at AU. I ate well. Oh dear Lord, I ate well. There is a buffet there with Bacon, sausage, eggs, bacon, a lot of different fruit, cereal, Coffee, bacon, muffins, Milk, different juices, bacon, and more stuff that I can’t remember. I would get up early just so I had plenty of time for breakfast. That’s just 1 meal. There’s Breakfast, mid morning snack, Lunch, another snack I think, Supper, and midnight meal (not included in the package, that’s where you sober up at….). There are wireless areas to catch up on your email and blogging. There is a hall dedicated to hundreds of industry retail and support companies with toys and gadgets and FREE STUFF!! Someone PLEASE get me an Autodesk shirt for my collection!!!! XL. There are events every night like the AUGI Beer bust, bands, Casino night…. …and the TAO Civil community “What was Autodesk Thinking with an open Bar” 2006 All night festival. Didn’t anyone tell management that the Civil guys all came in from a construction site somewhere. The bartenders looked like deer in the headlights. The scene reminds me of a pack of hungry coyotes…., It was savage. The poor SOB serving shots on the outside balcony once asked, “Hey, who ordered these Shooters?” It looked like Denzel Washington tried to walk through Opra’s audience. I may never forget that night. I wound up roaming the hallway near my room at 06:00 hrs with a heiney bottle still in my hand. I got my balance to see what time it was. “Hey, the chow hall just opened”. Here we go again. We once had Blue man group ….that was too fun! One night there is nothing planned….we call it meet the natives night…well that is what we call every night. Basically you get a bit of time to relax with some new friends and talk about AU. There are the most amazing restaurants, every show you ever wanted too see, and THERE ARE CASINOS. In 2006 there was this…….Ok, uh 2007 we all went to….ummmm, let’s just say I like Blackjack, beer, fun, and I have a cabbie friend on my cell phone speed dial to get me out of trouble. Oh, and don’t miss the AU Community Breakfasts. The food is spectacular, and you get to meet a lot more people, and see some interesting things about your career field. This sounds like a bunch of rediculous fun during an expensive educational TDY, and yes it is. We all study real hard, literally running for one class to another. It is exhausting and really stressful. So we play hard together, and develop professional relationships that otherwise couldn’t be made. There is nothing else like it. In the past week we have seen some new possibilities of hope for getting to AU. The Free pass! If you were not one of the people blacklisted by James Wedding for bugging him about the results, then you may not know who won. Don’t worry, it isn’t you. Me either. 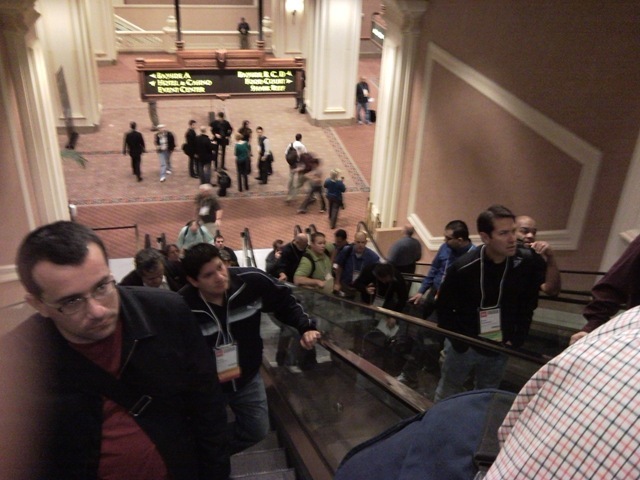 The there is the Buddy Pass offered by Autodesk to fill those hotels. If you know anyone who needs a chance to go, maybe you’ll help them out and sign them up as a Buddy for Free!! The community is filled with people who love to learn new things about the industry, and are just dying to tell you about it, and answer questions that you probably have. After the classes, most instructors take questions. Usually there are 20 or so people waiting after class to ask the instructor something about the examples shown during the session. (These are usually the people who are trying to get the most out of their AU visit) Everyone listens to each remark, and then occasionally start pairing off with interest about the information related. This leads to networking. Hey, I’ve heard about that recently….where did I see that? When an issue occurs of a problem can’t be solved quickly, the instructors note the issues and get back in touch with the individuals, and continue to help them simply because they attended the class, and asked for help. The Instructors selected usually have a fair amount of real world experience with the topic being related. They have been there before, and have decided to bring you solutions to problems that they know you need. You can ask your manager or IT person a question any time, but you are going to hear the same process you have already heard before. There are hundreds of instructor’s at AU, spread across the industry, who have solved similar problems, using a variety of methods. The only way you are going to get an understand of the processes and solutions that are possible, is to go sit in class. They want to help. They have spent a lot of time preparing a class to deliver, and want you to come away with a smile on your face. They know you need answers, and want to be the person delivering them. Ok, Let’s drop some names. These are not the only people that were good, but ones that I can say really bent over backward to ensure not only my AU experience was useful, but that problems I had after I returned home were dealt with as well. Dana Probert, Dan Banach, Barbara Bowen, Nancy Tremblay, Matt Murphy, Rickard Lindgren, Angel Espinoza, and Kevin Schneider just to name a few. Given the opportunity, these people will work hard to satisfy your needs and to really make you feel that the solutions you seek are possible, and more useful than you had expected. Give them the chance, and be sure to thank them when you do. Check back next time for the next installment, ‘amenities’!! !